Despite the sad past of the Mavrodi pyramid in Russia, numerous media reports calling it a scam and even recent detention of leaders promoting the system in India, MMM members are not ready to abandon their dream for better life. “We are fine though we have not been eating for last 12 days. We are inspired by idea, by the system and firstly by truth! 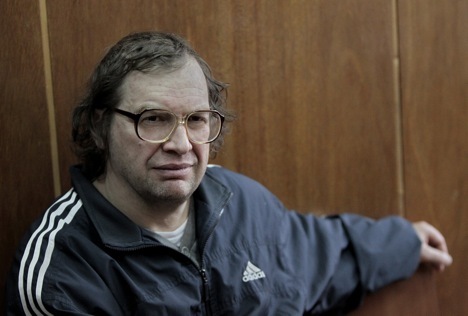 Together we can do a lot, we can change the world,” says Alexey Muratov, the leader of Mavrodi Mondial Moneybox (MMM) India in a video recorded on a mobile phone presumably in custody in Assam. Muratov looks quite worn out. A day after the video was posted on the MMM India website, the number of views is less than 100. It looks like a hunger strike may not be worth it. Sergey Karmalito, senior counsellor at the Russian Embassy in Delhi, told RIR that there had been no news from Alexey Muratov and his colleagues, Denis Rozhkov and Andrey Kilin, since the past few days, though Russian Consulate in Calcutta is trying to communicate with local police and get the latest news. At present the trio is in medical custody at a hospital where they got transferred at their own will after they started a hunger strike. “Till now it is not clear what they may be charged with as the court hearing will not happen as long as they stay in hospital,” Karmalito said. Few days before MMM leaders were detained in Assam, in a small office space in Navi Mumbai some MMM India employees spent all evening explaining how the system can change the life of simple Indians. The audience listened with interest though hardly anyone can understand the complicated explanation of the flaws of the global financial system. Most of the time, Mavrodians spoke about global injustice: rich become richer and poor become poorer. While MMM is easy and fair: no bosses, no directors, no rulers, no offices, no documents. And all people in the system are equal. The rules are simple: register, get aces to automated software, provide financial help to others and get financial help yourself. The virtual currency “mavro,” which is growing at 30percent per month can help a person easily earn lakhs! That sounds appealing for the target audience: poorly educated people with low or middle income, mainly from rural India. The MMM idea of changing life, giving political and financial power to the poor was the main focus of Muratov’s team preaching. The experience of many Russian MMM investors who lost their money in 1990s did not prevent some of them from investing once again in 2011- 2012. Needless to say that in India it is even easier for MMM to worm into people’s confidence. The dream of becoming “crorepatis”, as MMM India website promises, has turned many heads of rural Indians so far. Prasanth, 38, a real estate dealer from Navi Mumbai is with MMM since its very beginning. He proudly claims he had brought on more than 10,000 people to the system and till now everybody is happy. He himself invested lacks of rupees in the system and is sure he will benefit soon. Prasanth is lucky: till now he did not lose his money like many other members of MMM India. In the end of March, the main Facebook page of MMM India having about 16 000 fans (page has been closed since the arrest of MMM leaders in Assam) was full of vexed posts. The system through which people generate “help orders” and transfer “mavro” got crashed. Thousands of panic-stricken members could not withdraw their money. “MMM websites are under the biggest DDOS attacks ever!” Mavrodi announced that time. Local MMM leaders kept saying the system will be on soon. It was up, but all accounts showed zero. MMM chieftains restarted the system. All the fuss with hackers was just a cover. “Each system restart should be justified somehow. In India they said it was hacking, servers crashed and so on. But restart was necessary. This is how the financial pyramid works – if the inflow is less than outflow, the mechanism stops and the system must be restarted. The pyramid managers decide when to do it”, Alexandr Kolbasov, ex-manager of MMM-2011 and ex-right hand of Sergey Mavrodi explained in a telephone interview. He added that political part of MMM work is very important to avoid system crashes: “If you tell people to withdraw money not at once but slowly, the system will be stable. But if people start panicking for one or the other reason and start withdrawing money, there will be never enough money for everyone”. Aleksand Kolbasov today makes a living by teaching people about financial schemes and investments. He was removed from the leadership position in MMM in 2012 and finally from the system in March 2013. The reason, he believes, is internal politics: a person whom Kolbasov had earlier appointed as manager of international section of MMM took over the post. Kolbasov still believes in Mavrodi’s philosophy of Financial Apocalypse. In India, Kolbasov says, the idea of social revolution that will bring financial freedom to the poor, turning back to Gandhi’s ideas was the main strategy of MMM. Not only global goals but personal passion for political leadership drove Alexey Muratov. “He was a local politician in Russia so he was interested in political process in India, too. From financial point of view, as it is very difficult or almost impossible to take money out of India, there is no point to think he purposed this object while promoting MMM in India. Alexey wanted to have more supporters to become probably a political figure in India. And as I know, there were some problems with the head of that state where they were arrested,” Kolbasov told RIR. Kobasov says some local system members who broke away from the mainstream and started their own system taking MMM as a model, at MMM they are called “dissenters”, could help the arrest of MMM leaders. Talking to RIR through a video message (Sergey is hiding from the world for past several years) Mavrodi admitted that Muratov had political goals in India. He insists it was in line with MMM philosophy though. “He discussed the strategy with me personally. His goal was Financial Apocalypse, changing the deeply unfair global financial system, which MMM wants to abolish. Alexey did not have pecuniary interest in all this. All the payments in the system happen between people. Alexey or anyone else was not getting any benefits from it so there should not be any blame of fraud. Moreover all people were informed that participating in MMM is risky. It’s written on the website, everywhere! ” Mavrodi says. MMM offers from 20 to 60 percent interest without any guarantees and any documents. Risky? Definitely. As any other financial pyramid, MMM works on people's hope or belief which is often stronger than the fear of risk. MMM restarted not only in India but twice or thrice in Russia in 2013. According to Kolbasov, it is not a good sign for the system. Today the number of members in Russia and CIS countries is not more than 10000 people while two years back it was about 2.5 million. The amount of money in the system (excluding the money already taken out) is also not as great as before: while in Russia & the CIS it is about US$5 million, Kolbasov estimates, in India it can be about USD $ 7-10 million considering the number of MMM Indian members is about 50,000.